From a writer whose work has been praised by Junot Díaz as “Latin American fiction at its pulpy phantasmagorical finest,” Don’t Send Flowers is a riveting novel centered on Carlos Treviño, a retired police detective in northern Mexico who has to go up against the corruption and widespread violence that caused him to leave the force, when he’s hired by a wealthy businessman to find his missing daughter. A seventeen-year-old girl has disappeared after a fight with her boyfriend that was interrupted by armed men, leaving the boyfriend on life support and the girl an apparent kidnap victim. It’s a common occurrence in the region—prime narco territory—but the girl’s parents are rich and powerful, and determined to find their daughter at any cost. When they call upon Carlos Treviño, he tracks the missing heiress north to the town of La Eternidad, on the Gulf of Mexico not far from the U.S. border—all while constantly attempting to evade detection by La Eternidad’s chief of police, Commander Margarito Gonzalez, who is in the pockets of the cartels and has a score to settle with Treviño. A gritty tale of murder and kidnapping, crooked cops and violent gang disputes, Don’t Send Flowers is an engrossing portrait of contemporary Mexico from one of its most original voices. 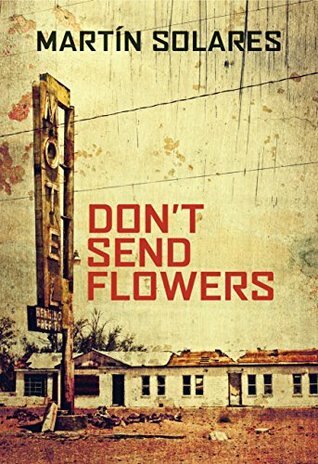 Don’t Send Flowers by Martin Solares is a 2018 Grove Press publication. There aren’t many crime dramas one can recommend by saying ‘this is an important book’ or a ‘must read’. However, this book might be the exception. For those who are fed up with implausible plot lines, constantly craving realism in your fiction, you will have met your match with this novel. While it makes for a great work of fiction, unfortunately it is all too plausible, and all too realistic. It will certainly put things in perspective. When the sheltered girl of a wealthy man is taken hostage, a former detective, Carlos Treviño, is hired to find her, while attempting to fly under the radar of Commander Margarito Gonzalez, the corrupt chief of police. Sometimes an overused word is still the only one that will adequately describe something. In this case, I can’t think of a more apt word to describe this novel than 'gritty'. This is a vivid, very depressing look at Mexico, and what has become of it. The story is a well developed, raw, intricately detailed crime thriller, packed with stunning twists, and edge of your seat suspense. This book has been accurately labeled as 'noir', a personal favorite of mine, which does help to offset some of the grit, giving the story a bit of polish and smoothing out some of the rough edges. The novel is taut and edgy, perfectly paced, with such well-drawn characterizations, it was like I was actually there watching these horrible and strange events unfold in real time. I do wish this book would see more coverage, gaining enough momentum to cross over into the mainstream consciousness. This novel is not just a strong crime drama, a well written piece of noir fiction, but is also a searing portrait of the current situation in Mexico. Reading this novel, even if one is not exactly a huge fan of crime thrillers would assuredly raise awareness of Mexico’s plight. This story is so intimate, it gives readers an up close and personal look at how drug lords rule over law enforcement and politicians in a way news reports could never convey. Yes, it is fiction, but it’s the most realistic and one of the most unforgettable crime novels I’ve read in a long time. Martín Solares is a Mexican writer whose first novel, The Black Minutes, is a crime thriller that, according to a Publishers Weekly contributor, "treads a ... tightrope between police procedural and surreal fantasy." 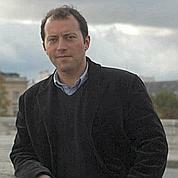 Awards include: Premio Nacional de Cuento Efrain Huerta (the Efrain Huerta National Prize for Short Stories), 1998, for "El Planeta Cloralex"; Rómulo Gallegos International Novel Prize (shortlisted) for The Black Minutes. Wow! This sounds like an excellent book! Adding it to my TBR list -- thanks for a great review. Thank you, Kristine!! I hope you like the book as much as I did. Thank you for stopping by The Book Review and Happy Reading! !